ZIZ News — Residents of the Sandy Point community came under the serious threat of fire Monday afternoon. 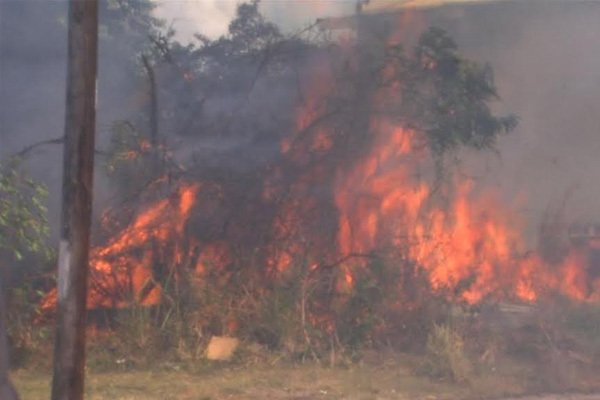 A large expanse of bush land was ravaged in the blaze which occurred on Monday in sandy point. High winds made the situation worse. A lone fire truck and its team of fire fighters worked diligently to contain the blaze, however, the true heroes were the residents of Sandy Point who came together to help each other save their homes. Teams of neighbours were seen hauling hoses and buckets of water with which to spray their homes and those of neighbours who were away at work, possibly unaware their houses were in danger. Three small structures, which were reportedly abandoned, were burnt to the ground. As the fire spread downwards to the village at least four homes came under direct threat of catching fire. Members of the community told ZIZ News that unexplained fires have been plaguing the area since the beginning of the year. While there was no official report of serious injury, one woman claimed that her small child received burns to his stomach before he could be evacuated from a home nearby. Another woman, who wished to remain anonymous, said she had to rush her child to the nearby Pogson Medical Center for treatment after he complained of difficulty breathing as a result of the thick smoke. Several residents were very vocal about their disappointment in the fact that only one fire engine was dispatched to answer the call. While they commended the work of the fire fighters, they were annoyed greater priority was not given to the spreading fire which was clearly too much for the single fire engine to address. The truck made at least two trips to nearby hydrants to refill as it had depleted as many times. However, in an interview with ZIZ News, Acting Fire Chief Everette O’Garro explained why there was only one fire truck on scene. Fire Chief O’Garro is urging residents to take the necessary precautions in wake of a recent spate in brush fires.